Motels Plano: Stay At Our Extended Stay Hotel Over Spring Break! We know that Christmas and New Years are barely in the rear-view, but it’s never too early to start thinking about your next chunk of time off: spring break! With so many options all over the country, it can feel almost impossible to decide which location you most want to visit to blow off some steam before the end of the school year. In this blog, we will cover a few reasons why you might want to come to Plano for your spring break! While you’re here, we recommend booking a room here at Studio 6. We are an extended stay hotel that has everything you need to make your time off more comfortable and fun! Contact us as soon as possible to make sure we have room for you! While you’re probably trying to get as far away from your school as possible, if you have friends who are enrolled at any of the area universities, staying in Plano is a great way to hang out with them without having to stay at someone’s cramped apartment or at their parent’s home. Thanks to Plano’s centralized location, there are many universities nearby that might offer special courses or seminars that can help enrich your education or help you land a better job after graduation. Plano is only about 40 minutes away from the Dallas/Fort Worth area, which means that you have access to all of the incredible things that the cities have to offer. From nightlife to museums and everything in between, if you want to have a well-rounded spring break where you spend some time partying and some time learning, Plano is a great place to be! While Plano isn’t too terribly far from the warm waters of the Gulf of Mexico (it’s roughly four hours away), there are plenty of large lakes that are a perfect place to relax and have some fun during your time off. We’re only minutes away from Lewisville Lake, and not much further down the road is Grapevine Lake. The area around Plano is teeming with many different natural areas that offer great hiking trails and nature walks where you can enjoy some of the beautiful Texas landscapes and soak up some sun! Partying can be great, but there are tons of other awesome ways to spend your spring break. “Alternative” spring breaks have been growing in popularity over the years because they provide participants with something fun to do that also helps them give back to communities and locations that might need some help. This excellent extra-curricular activity looks spectacular on grad school applications and it is a wonderful chance to make friends and memories that you will cherish for years to come! 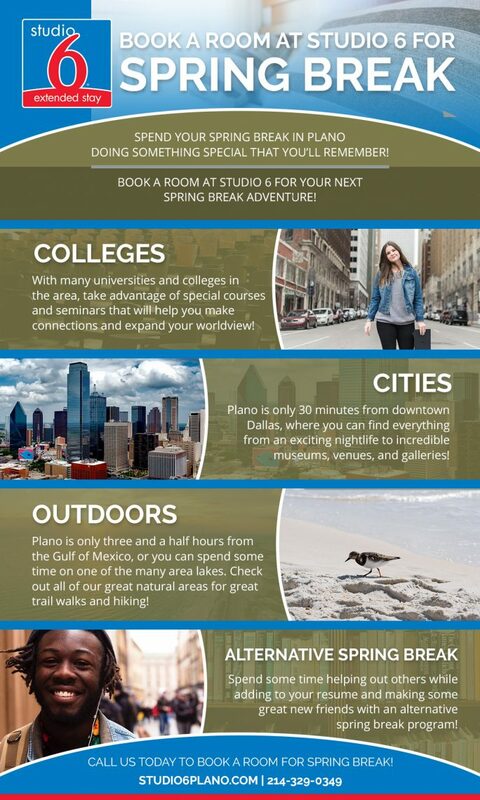 Contact Studio 6 in Plano today if you have questions about the area or if you want to book a room in our extended-stay hotel for your next spring break! Our rooms have been recently renovated and feature full kitchenettes, open and comfortable floor plans, and some of the most comfortable furniture you’ll ever find in a hotel!